Abstracting/Indexing: Science Citation Index, etc. The Lancet is the world's leading independent general medical journal. The journal's coverage is international in focus and extends to all aspects of human health. 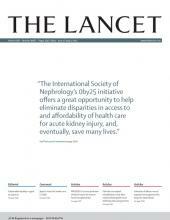 The Lancet publishes the original primary research and review articles of the highest standard. The Lancet is stringently edited and peer-reviewed to ensure the scientific merit and clinical relevance of its diverse content. Drawing on an international network of advisers and contributors, The Lancet meets the needs of physicians by adding to their clinical knowledge and alerting them to current issues affecting the practice ofmedicine worldwide. The blend of challenging editorials, signed commentaries, original research, commissioned reviews, an international news section, and the views of readers in the letters pages make The Lancet an essential weekly read for physicians all over the world. All submissions to the journal must be submitted online at http://ees.elsevier.com/thelancet.